Laine Crosby Henry pointed out that the XAT chat room had signed out everyone, so to get into the live chat room, people had to re-sign in. Ceiling Cat Barbara Duncan introduced our investigative medium guest Laine Crosby, author of Investigative Medium: the Awakening, about her true story discovering being a medium. Henry asked about her appearance on My Ghost Story, her remembering (the season five, thirteenth episode), episode being called Caught On Camera. They also spoke about Mr. G's Ice Cream in Gettysburg. Laine spoke of her first spiritual encounter, where she was compelled to drive to a mansion at which a ghostly voice in Laine's mind, Jeannette, confirmed the ghost had lived there, as well as how disconting such was for her skeptical husband, who strongly resembled the plantation's former owner, with whom Laine's ghost had been in love when they were alive. She clarified how she Senses communication from Spirit. Laine offered Henry and Kat tours of the David Stewart Farm, where Laine enjoys investigating. They discussed her relationship with various spirits. Her house even began getting filled up with spirits; she had to "ban" them out to the yard, as their presense was affecting the rest of Laine's family. She spoke about the probability of her backyard having been a former cemetery from which the headstones had been removed. She's "worked with" the spirits to show her where they're respectively buried. She spoke of one encounter during which she acted as mediator between a woman spirit and a native american spirit, the latter of whom was so angry at Laine that his energy was enough he was able to manifest to her eyes, and nearby investigators photographing got various photographic anamolies. After the second break, CC reported our having listeners tonight in the US, Canada, the UK, Australia, Norway, and Unknown. Laine discussed her relationship with a little girl ghost named Anna Bell, which for years she thuoght was Annabelle, until she came across the fact that the girl's name was Anna Bell. I was brought in upon my arrival, my having just attended a brilliant if longer-than-expected movie as a SAG Nominating Comittee member. Laine pointed out having seen my 2009 Superbowl commercial for Pedigree, with the ostrich. As friends of her were in the chat room and asked as to the progress of her upcoming books; Laine is working on a sequel to her book Investigative Medium: the Awakening, as well as a book on Real Daughters; about those who fought for the Confederacy,. plus a book about General Sherman's march to the sea. Henry asked if she'd ever visited Fort Fisher, and, as she had not, what its cemetery entailed. Henry told Laine about some of his investigations with Kat when they've broadcast live from various haunted locations. As usual, when Henry gives Kat or me enough room so as to make a little humour at his expense, we certainly did so, further endearing us to Laine. Laine gave out her lainecrosby.com website, her books being at amazon, et al (her books are linked from this page below), considering she could not recall the name of her How to Cleanse Spirit Energy book; her Facebook page, her @lainecrosby on Twitter, as well as her being on Instagram and tumblr. I gave out my website's my Paranormal View hub page, indicating people from there can find the show's respective report pages and previous show archived podcasts, my @realbadger Twitter, my being findable on Facebook. Kat gave out the show's @Paraviewradio on Twitter, her Jinxed Comic site, which also has a @jinxedcomic Twitter page. Kat did not give out her own @KatKlockow Twitter account, nor the show's Facebook community page her own author website tonight. We can be contacted by email, the official Paranormal View page, and previous shows are available on iTunes. Henry announced that the next week we would have guest Ron Kolek, about the New England Ghost Project, and we wrapped out. 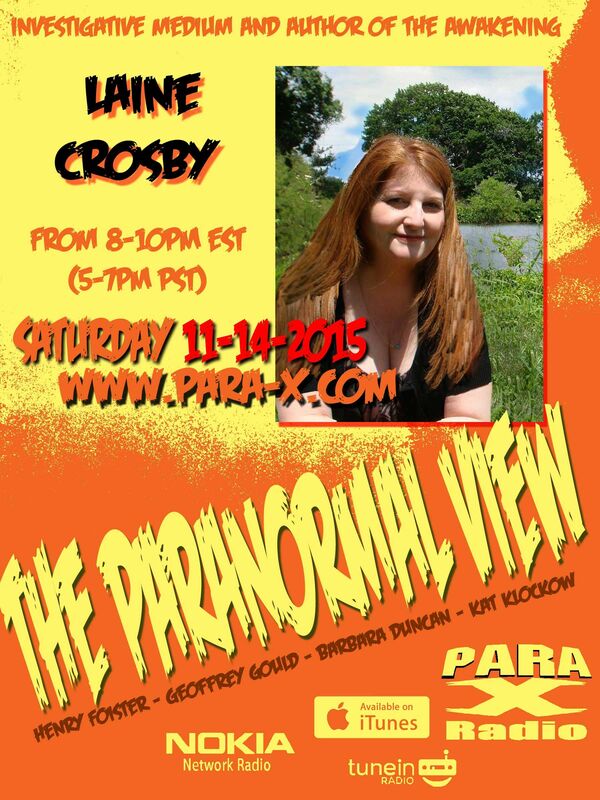 14 November 2015 The Paranormal View.